Amazon plans to add 3,000 jobs at an expanded tech hub in Vancouver, Canada, the online retail giant announced Monday. Prime Minister Justin Trudeau appeared at the event with Vancouver employees at the site of a planned 416,000 square foot Development Center, which is scheduled to open in 2022. More than 6,000 people currently work for Amazon in Canada, including 1,000 researchers and engineers in Vancouver at several sites. The new site will site above the former Canada Post building, a city landmark serving postal needs. "Our vibrant cities, which are home to some of the best talent in the world, are poised to attract premier investment that creates the jobs of tomorrow," Trudeau said. "Canadians share your passion for invention and your commitment to excellence -- and that's why we are excited to see Amazon grow here in Vancouver." Amazon said the additional jobs will be in e-commerce technology, cloud computing and machine learning. Currently, the company's Vancouver workers produce new products and services for the company's international retail business and Amazon Web Services. "Amazon's decision to bring another 3,000 jobs to Vancouver is great news for our city's booming innovation economy," Mayor Gregor Robertson said. "We are home to the fastest growing, most resilient and greenest economy in Canada and Amazon's major expansion in our city means more long-term jobs for people who want to live, work and build a future in Vancouver." Amazon opened a 156,000-square foot location in Telus Garden in 2015. And last November, Amazon announced planed to add another downtown site in 2020 with 1,000 workers. 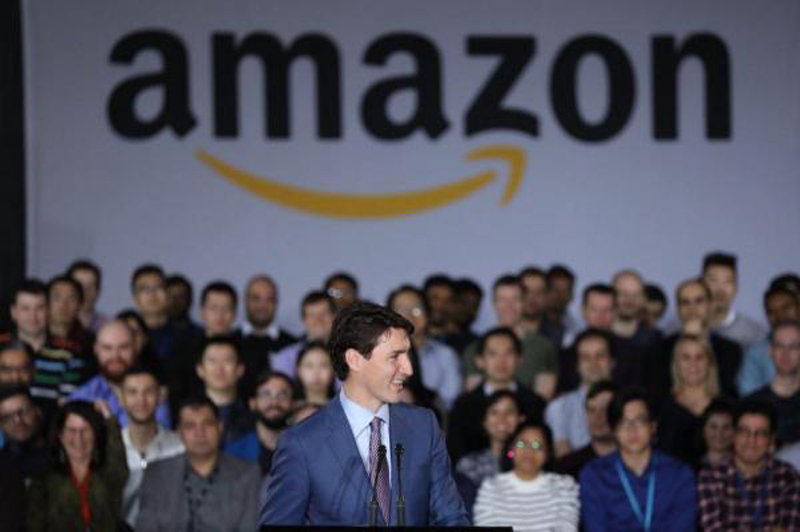 "Vancouver is home to an incredibly talented and diverse workforce, and these thousands of new employees will invent on behalf of our customers worldwide," Alexandre Gagnon, vice president of Amazon Canada and Mexico, said. Vancouver was among 238 cities and regions from North American that sent proposals to land a second headquarters with 50,000 employees, the same size as the one now in Seattle. Vancouver was not on the pared-down list of 20 cities announced by Amazon in January. The only Canadian city on the list is Toronto.